Mussorgsky’s opera is based primarily on a play by Alexander Pushkin, whose full title is A Dramatic Tale, The Comedy of the Distress of the Muscovite State, of Tsar Boris, and of Grishka Otrepyev. Pushkin claimed to have written this play “for the reading desk,” meaning he never intended it to be staged. One might say that he endowed major and minor figures of Russian history with first-person voices as his way of reflecting on a period known as the Time of Troubles. The result is that each of the scenes of Mussorgsky’s opera is based on what as almost a Socratic dialog on some aspect of Russian life during that period. The original version, completed in 1869, had seven of those scenes. When Mussorgsky revised the score in 1872, he dropped one of the scenes and added four, two of which took place in Poland and have come to be called the “Polish Act. Last night’s performance consisted of seven scenes, six from the 1869 version and the final scene from the 1872 revision. Given that most of the text had its origins “for the reading desk,” there is no particularly compelling reason why Mussorgsky’s score cannot be given a simple concert treatment. Because so much of the text (not to mention the music) involves reflections on action, rather than action itself, Boris Godunov amounts to more of an oratorio than an opera. However, these days there seems to be a contingent of stage directors who do not know to leave oratorios well enough alone, although Darrah has established himself as one of their more capable members. He was particularly effective in his staging of the SFS performance, again conducted by MTT, of Ludwig van Beethoven’s Opus 123 “Missa solemnis” in June of 2015. Darrah’s approach to Mussorgsky never came close to the imaginative inventiveness he brought to Beethoven. Bordenave’s choreography did little more than get in the way, while much of the staging of the SFS Chorus resulted in singers losing eye contact with both conductor and musicians, resulting in a few disquieting cuing errors. More importantly, Darrah never seemed to have a clear idea of what Pushkin was doing or what Mussorgsky was doing with Pushkin. The result was one of major gaping holes in the action that never got filled by any sense of motivation. Where the action was most explicit, the performance was most satisfying. Bass Stanislav Trofimov delivered a dynamite account of the leading role. His enactment of Godunov’s death (in the sixth scene of last night’s performance) was definitely a sight to behold; and I would like to believe that much of the body language can be attributed to Darrah’s efforts. Where minor characters are concerned, Vyacheslav Pochapsky delivered a thoroughly engaging (as well as more than a little alcohol-saturated) account of the siege of Kazan by the dissolute monk Varlaam. 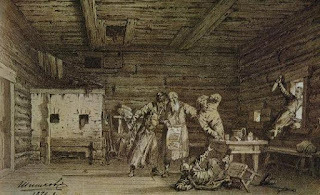 In that (fourth) scene in an inn on the Lithuanian border, mezzo Catherine Cook’s portrayal of the innkeeper never missed an opportunity to steal audience attention, whether or not Darrah had a hand in the works. In contrast tenor Yevgeny Akimov captured every Machiavellian detail of the opportunistic Prince Vasiliy Ivanovich Shuysky, while bass Philip Skinner perfectly nailed the minor role of a thuggish police officer in the opening scene (once again presumably based on input from Darrah). The rest of the time, however, the production lumbered along with not much sense of orientation. Even the orchestra seemed more than a little out of place during the second (coronation) scene. This should not have been a surprise: When the orchestra players were not being shouted down by the chorus, they were being overwhelmed by the heavy bells in the Terrace that obscured even the loudest of any other sound sources. Finally, there were clearly some higher-level problems of organization. The program book suggested that this would be a trimmed-down performance lasting about 115 minutes. This turned out to be about 90 minutes short of the mark. Of course those of us who have devoted much of this week to spending our time across the street are well adjusted to Richard Wagner’s penchant for extended durations. However, the stagecraft being presented by the San Francisco Opera is in such a different league from last night’s approach to Boris Godunov that it was no surprise that the Davies offering not only felt unduly lengthy but also turned out to be that way.